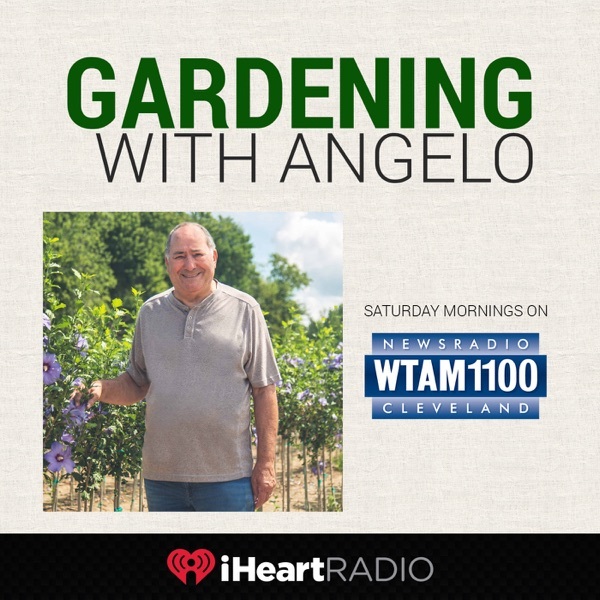 Hear Gardening With Angelo Saturday mornings on Newsradio WTAM 1100. Angelo has his weekly tips for you to use as we get into the growing season for your gardens and lawns. Plus, he is answering the listener's questions they have with their gardens and lawns. Angelo talked about the Soil loosening up now past second week of spring and spoke to callers about planting and trimming. Angelo is in and says that this rain we are having will give us a spring look and it will set up the buds to swell. He also has some other tips to help you get your gardens ready for spring. Angelo has the answers to all your gardening questions. Angelo says that with the weather being cool throughout March is a good thing for the blooming season, he also some tips for you to clean up your yards and gardens. Plus, he is answering all of your gardening questions! As we are all anxious to get outside, Angelo has some tips to give you as the weather warms up a bit this week. Plus, Angelo answers all of your gardening questions! Angelo is back for a brand new season of helping you with any of your gardening questions! He has some tips for you to start preparing your plants once the warmer weather begins. Angelo is in for the 2nd to last show of the season and he gives you a few more things to get done before the gardening season is over. Plus, Angelo is answering any gardening questions you have! Angelo is back this week and he has his end of the season tips as it is rapidly approaching. Also, Angelo is answering any questions you have on your lawn and gardens! Noel is in for Angelo today and she has some fall tips for you to put into effect with the changing temperatures we have had this week. Also, she is taking your questions on your gardens and lawns. Angelo is in this week giving you some tips with the cooler weather coming to spray around your house to prevent the insects from coming in. Plus, answering any gardening questions you may have. Angelo says fall is setting in so he has some tips for you to do over the next few weeks to make sure your lawns and gardens are ready for winter and next spring. Also, Angelo is answering any questions you have with your gardens and yards! Angelo is back this week and he is talking about doing a few things to do as we start the fall season. Plus he is answering all of your gardening questions! With nice weather being here, Noel has some tips to help you tend to your lawn and gardens. Plus, she is answering any questions you may have! Noel is in for Angelo this week and she has some tips for you to use when getting your tasks done outside. Plus, she is taking your calls on any gardening questions you have. Angelo is in this week with some tips for your gardens including taking a look at your annuals as it may be time to trim them back. Plus, Angelo is taking your questions on your gardening needs! Angelo is back this week and he his telling you how to get your gardens and plants ready for the fall weather. He is also answering any gardening questions you may have! Noel is in for Angelo this week and she has some pointers for you to deal with the weeds popping up in your lawn and gardens. Angelo is in telling you what you need to do keep your plants and yards looking nice when the rain moves through. Angelo is answering any of your gardening questions you have! Angelo has shares some tips to refresh your plants right now to make them look great throughout fall, then Angelo is taking your gardening questions! This week Angelo is in giving you some tips that will help your plants and gardens to thrive at this time of the year. Angelo is answering all of your gardening questions you may have! Angelo is back this week and he is giving you some watering and harvesting tips for your gardens to make sure everything keeps growing. Plus, Angelo is taking your calls on any gardening questions you have! Noel is in for Angelo this week and she has some tips to keep maintaining your gardens and plants as we continue through the summer. Plus, she is taking any of your gardening questions you may have! Angelo gives you his weekly tips to help you with your gardens and plants by telling you to watch out for the insects laying eggs on your plants and lawns. Plus, he takes your gardening questions! Angelo is back this week and he his giving you some tips to keep your gardens and yards looking beautiful during this summer heat. Also, Angelo is taking your calls on any questions you have! Noelle is in for Angelo this week and she is talking about the fluctuating weather we have had this week, including the humidity What it means for your plants and you can prevent the problems that may come. Also, she is answering your questions! This week Angelo is giving you a list of things to do over the next couple of weeks and tips on maintenance for your lawn and gardens with the summer season starting soon. Plus, he is answering any questions you have on your gardening needs. Angelo is back this week taking your questions on the concerns you have with your plants, gardens, and lawns! Noelle fills in for Angelo! This week Angelo is discussing the challenges for your plants, lawns, and gardens with the heat that we had this week. Also, Angelo takes your calls and answers any questions you may have. On today's show, Angelo is talking about how the weather conditions are ideal to plant right now. Soil is the most important thing to take care of when planting vegetables. Plus, Angelo is taking your questions on any needs you have with your plants, lawns, and gardens. Angelo is talking about making sure your settings on your lawnmower are ready for summer, treating your lawn for weeds, getting your planters to look beautiful and much more! Plus, Angelo is answering any questions you have on your yards and plants! With a spring-like sunrise, Angelo talks to callers who are looking to finally start their yard-work this weekend. Best time and ways to prepare your soil, planting, and the best ways to water your garden. Angelo also talks to callers about preparing their gardens for the spring. With warm weather upcoming, Angelo gets your garden ready for the next week of warm and dry weather. This week Angelo is talking about treating your yards, flower beds, and trees over the next two weeks to get ready for warmer temperatures. Also, he talks about what to do for your perennials to get them ready for the year. As always, Angelo is taking your calls and answering any questions you have! Gardening With Angelo 4-7-18: Where Is The Spring Weather? Angelo is in this week telling you what you can do to prepare your plants and gardens for the warmer temperatures that are on the way. Plus, Angelo is answering any questions the listeners have on their plants! Angelo is in this week and he has some tips for you to get your yards and gardens ready for the season. Also, Angelo is taking your questions dealing with your plants, gardens, and yards. Angelo is giving you some tips to prepare your plants and gardens for when the warmer temperatures show up. Gardening With Angelo: Spring Is Next Week! Angelo is in for the last show of the season! He has some tips to use for the next few weeks which include lawn care, planting trees and shrubs, tips for your bulbs, and much more! Plus, Angelo is answering your questions! Angelo is in this week letting you know what to do at the end of the gardening season. Keep lowering your lawnmower, use some weed killing to keep your flower beds clean, and now is a good time to plant bulbs for next year! Plus, Angelo is taking your questions! Angelo is in this week talking about moisture. He says to make sure to keep watering your trees so they do not dry out during the winter. It would be a good time to fertilize your lawn with rain in the forecast over the next couple of days. Angelo is also answering any questions you have! Angelo is in this week letting you know what you can do to prepare for winter including checking for rodents and insects around your house and as fall moves on make sure to lower your lawnmower to keep the grass low, plus many more tips! Plus, Angelo takes your calls! Angelo is in this week reminding you to keep watering your plants and trees to make sure they are ready for winter. It is also a good time to clean up your flower and vegetable beds and get them prepared for spring! Noelle is in for Angelo this week and she has a few tips for you as we are officially in the fall season. Plus, she is taking your questions you have concerning your gardens and lawns! Angelo is in this week giving you some fall gardening tips to help prepare for winter and for next year's gardening season. The first September weekend is cooler than usual. It's the dry season. Angelo talks about what you should do with your plants as the summer wraps up. Noelle from Petitti's filled in for Angelo and gave you tips on Late Summer gardening with callers questions. Six Weeks Left In Summer! Six weeks left in summer and Angelo has some tips to keep your gardens and plants growing and looking good in these last six weeks of summer. Also, Angelo says right now is a good time to plant certain plants and fruit trees. As always, Angelo is answering your questions dealing with your plants, gardens, and yards. Angelo is back! This week Angelo is talking about keeping an eye on watering, regardless of the rain we could get. Also, he says it is the last time to feed your plants, but keep an eye out for the bugs that could harm them. Plus, he answers any questions you may have! Noelle is in for Angelo this week and she has a couple tips to use to help your plants at the end of the month during the summer. Noelle is in for Angelo this week and she has a few gardening tips for you that are watch the over watering and keep feeding you plants! Plus, she is taking your calls on any gardening questions you have! Angelo is in on this Saturday and is talking about how moisture has been an issue this week for your gardens and the vegetable gardens. He gives you some tips on how to deal with the issues it has caused. Plus, he is answering your questions on any gardening topics. Angelo is in on this Saturday morning talking about your vegetables getting to their peaks and giving you tips on how to deal with Japanese beetles and other pests around your garden. Plus, taking your questions! Angelo is in talking about dealing with crabgrass and taking your calls on any questions you have!